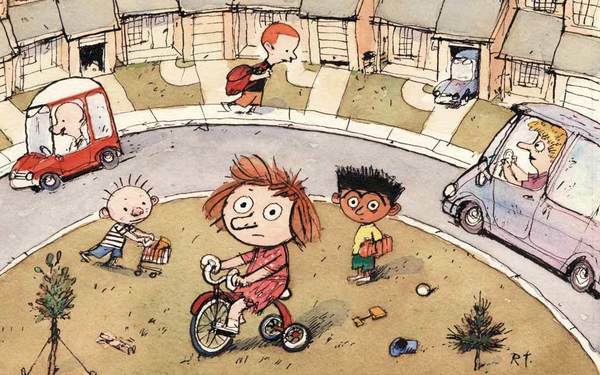 Richard Thompson's Cul de Sac, is a comic strip about the life of a pre-school girl named Alice Otterloop. It is a light-hearted comic strip centered around a four-year old girl and her suburban life experiences on a cul-de-sac with her friends Beni and Dill, older brother Petey and her classmates at Blisshaven Academy pre-school. Alice describes her father's car as a "Honda-Tonka Cuisinart" and talks to the class guinea pig, Mr. Danders. She has the typical older brother who plays jokes on her, and she contemplates ways to keep the scary clown from jumping out of the jack-in-the-box with friends.